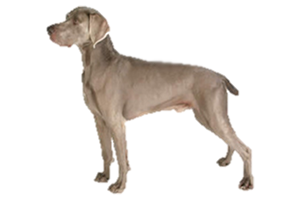 The Weimaraner is one of the all-around gundogs, it is capable of pointing, trailing game, flushing and retrieving. They were originally used to hunt large game such as deer, wolf, bear and boar, but as prey dwindled it became improved as a bird dog. A rarer, long coated variety of this breed exists, however it is not recognized by most kennel clubs. The Weimaraner was created in the early 1800s by the Grand Duke Karl August of Weimar in Germany, although dogs of this type had already existed for several centuries. The breed is often referred to as the "Grey Ghost", in reference to their distinctive coat. There have been several guesses regarding their ancestry, ranging from Bloodhounds to German pointers to French hounds. Specifically bred for nobility, a meeting was held in Erfort in 1897 to ensure they remained unavailable for ownership by the general public. They formed the Weimaraner Club of Germany and agreed that only select members within the club could own these dogs. If any member was forced to part with a dog for etiquette reasons the dogs we secretly sterilized before given away. In 1939 a true breeding pair was acquired by Howard Knight in the United States and he was able to set up his own breed club in 1941, followed by acceptance into the American Kennel Club (AKC) in 1943. Still, he kept to the ridged rules of the German club when it came to outside ownership. However, as years passed and the club grew it became impossible to keep to this tradition. By the 1950s the Weimaraner had reached Britain and soon after around the world.